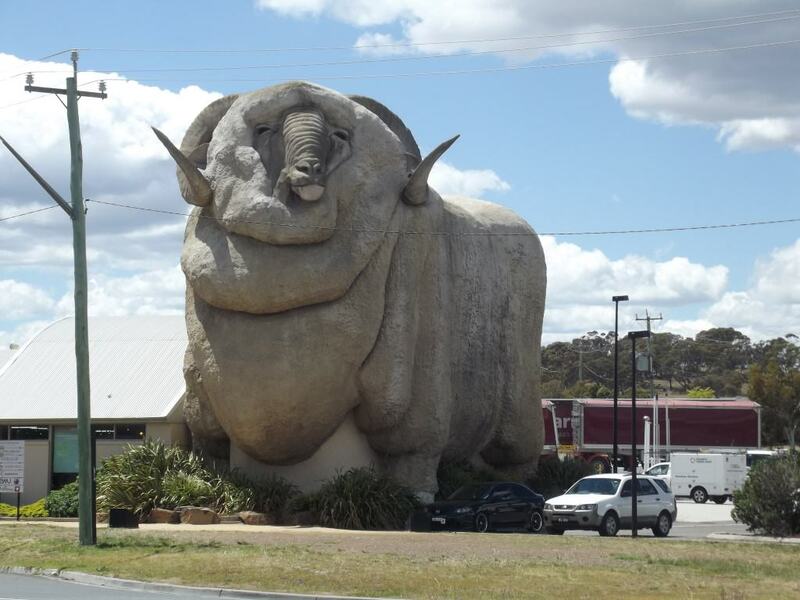 Goulburn, on the Southern Tablelands of New South Wales, is the only town in the world where you are greeted by a giant sheep! Seriously! Leave the highway at the southern entrance to the town and you will drive past the Big Merino, at 15 metres (49 feet) tall it is the world’s largest concrete sheep. Built in 1985, it is a monument to the district’s fine wool industry for which the area is famous. Prior to the bypass opening in 1992 this was the main highway to Sydney and many a traveller marveled at this unlikely guardian of the town. But with less passing traffic, Rambo, as it is known was stranded in No Mans Land. In 2007 the entire structure was moved 800 metres (½ mile) closer to the highway exit and received a new lease of life with a resurgence in popularity. We arrived late on a Tuesday afternoon and quickly settled into our accommodation at the Willows Motel ([star][star][star][star]). The Willows hadn’t been our first choice though. 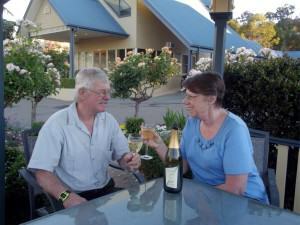 We had intended to stay at the Goulburn South Caravan Park and, in fact, had made a reservation some days earlier. So you can imagine how annoyed and frustrated we became when they told us that they were unable to get an internet connection and so they couldn’t let us have a cabin in the park. Whatever an internet connection has to do with giving us the cabin that we had booked, I don’t know. No offer to assist with other accommodation, we were simply told to go and find a motel somewhere! One thing is for sure, we will never recommend that caravan park to anybody and we certainly will never attempt to stay there again. The people at the Willows, however, were truly fantastic. We had no reservation there and at a time when most accommodation was full due to Parliament sitting in Canberra, they found us a cabin with no trouble. I can’t recommend them highly enough. It was too late by the time we were in our cabin to worry about visiting the Tourist Information Centre and so we settled in for our first night bubbly with Two Tails Sparkling Wine. 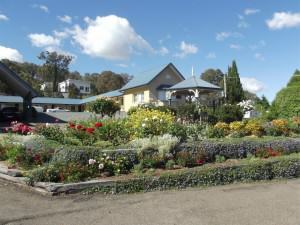 We chose to sit out in the motel gardens amongst the blooms that were quite spectacular. Whoever is in charge of the gardens here really has done a fantastic job. I should have such a green thumb! We toasted our first night in Goulburn and it really was quite pleasant there with the fragrance of the garden all around us. But with the sun setting the temperature dropped and before too long we were back inside the warmth of the cabin. holds the unique distinction of being proclaimed a city on two separate occasions. The first, unofficial, proclamation was by Royal Letters Patent issued by Queen Victoria in 1863 and the second, the official one, under the Crown Lands Act in 1885. Early the next morning we set off for the local Tourist Information Centre. With very limited time here we wanted to see all we could before we had to leave. The Centre is a fantastic resource and the staff members a veritable hive of information. I wanted to visit some of the heritage buildings and it was suggested we walk up to St Saviour’s Cathedral via Belmore Park. Sounded good to me and with sturdy footwear we stepped out to explore. Belmore Park is right in the centre of town but back in 1833 it was the city’s market square where all sorts of merchandise was exchanged, including livestock. That is hard to imagine today with its neat paths, magnificent trees, and carefully manicured gardens. 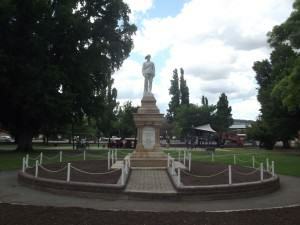 Many people refer to the park as the “heart and soul of Goulburn” and it still plays host to a number of community activities including its annual Carols by Candlelight. We wandered around the park for some time. I’d like to say we were lost in its tranquillity, and admittedly it is very peaceful there, but I was more interested in the history. We stopped briefly at the Temperance Fountain, a bit of an oddity in this day and age. It was built in 1886 as a gift from the Temperance Society. I think they were trying to tell the people of Goulburn something because, at the time the city boasted some 74 pubs or similar establishments! Of all the memorials in Belmore Park, one of the most prominent ones is the Boer War Memorial. Constructed in 1904, it consists of three sections, topped with a carved marble statue of a trooper, complete with rifle and bandolier. The detail is truly amazing and was hand-carved in Italy. At the top end of the park is a Rotunda. Built in 1897 at a cost of £80, it celebrates the record reign of Queen Victoria. I could have spent all day in the park but John was starting to make noises about moving on so we wandered up the hill to one of the most beautiful Gothic cathedrals in Australia, St Saviour’s Cathedral. The foundation stone was laid in January 1874 and the cathedral, as it stands today, was completed in 1884. However, the cathedral remains incomplete; the tower and spire depicted on the original architectural drawings were never completed. Still, it is beautiful and we wandered through the grounds marvelling at the detail in every one of the carvings in the stone. At the front of the church are some historical graves, including that of Mesac Thomas, the first Bishop of the Anglican Diocese. We left the cathedral grounds with every intention of making our way back towards the information centre when something caught my eye. Now John has often said that I can spot an historical building a mile away in heavy fog and he could be right. Not far along the road is the Old Cathedral of Saints Peter and Paul, the only greenstone cathedral in the world, and I had to have a look. 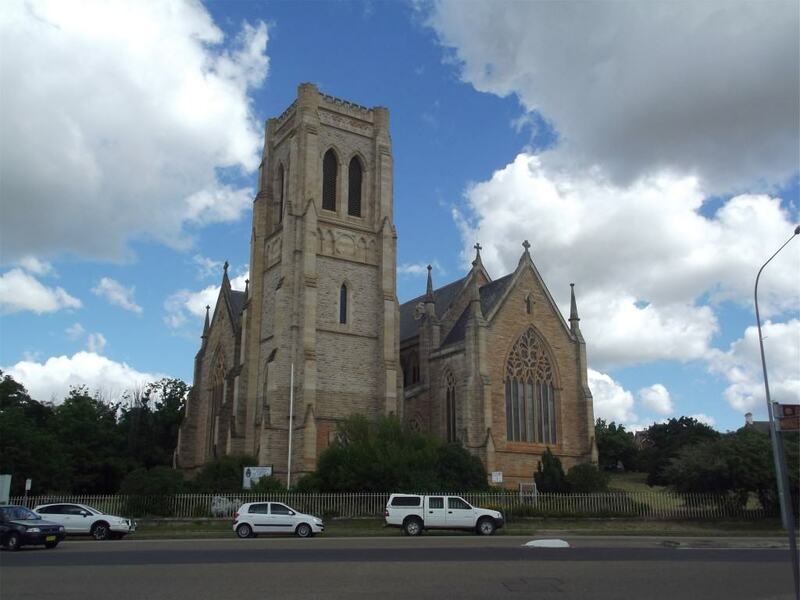 The first mass was celebrated in Goulburn in 1833 however construction on this cathedral didn’t commence until 1871. By now, John was tired of churches and memorials and so we strolled back down Verner Street and along through the main shopping street until we found a coffee shop. There are any number of cafés along there and we decided on the Paragon Coffee Lounge. What a nice place! And the coffee was good too. After our coffee we set off for the train museum; John was itching to go there. Yes, it’s historical but it is something he’s interested in. The Rail Heritage Centre is located at the Goulburn Roundhouse Museum. The Roundhouse is a huge part of Goulburn’s history as a locomotive depot and the 90-foot turntable, built in 1918, is still in operation today. In fact the Goulburn Locomotive Roundhouse is the largest operating roundhouse in NSW. John was fascinated with the rolling stock and, I must admit, so was I. 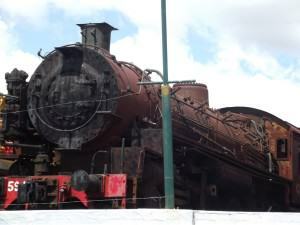 Some of these trains date back over 100 years. We found it all quite fascinating and would have stayed for hours but there was much more we wanted to see before we had to leave and so we drove up to the War Memorial and Lookout on Rocky Hill. It was one heck of a steep climb to get there and I didn’t think our poor old bus would make it up the hill but, back a couple of gears and we chugged along nicely. 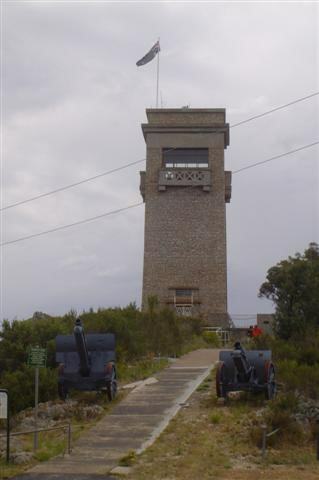 The War Memorial was built in 1925 and is a tribute to those who served in World War I. The museum wasn’t open that day and John was quite relieved; I think he’d had enough history for one day. But the views from the lookout were outstanding! The view takes in the entire City of Goulburn and the surrounding areas and it is spectacular. 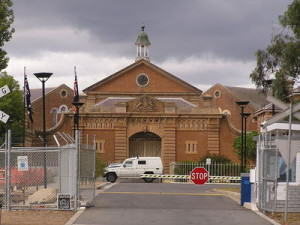 prison in Australia. 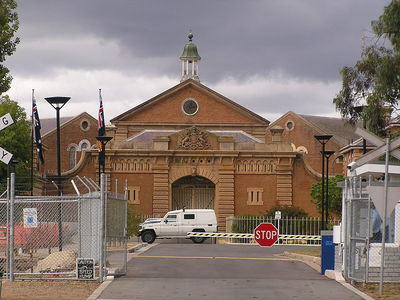 This place is home to some of Australia’s most dangerous and infamous prisoners. It gave me the willies and I couldn’t wait to leave. And so our last stop was a visit to the Big Merino. 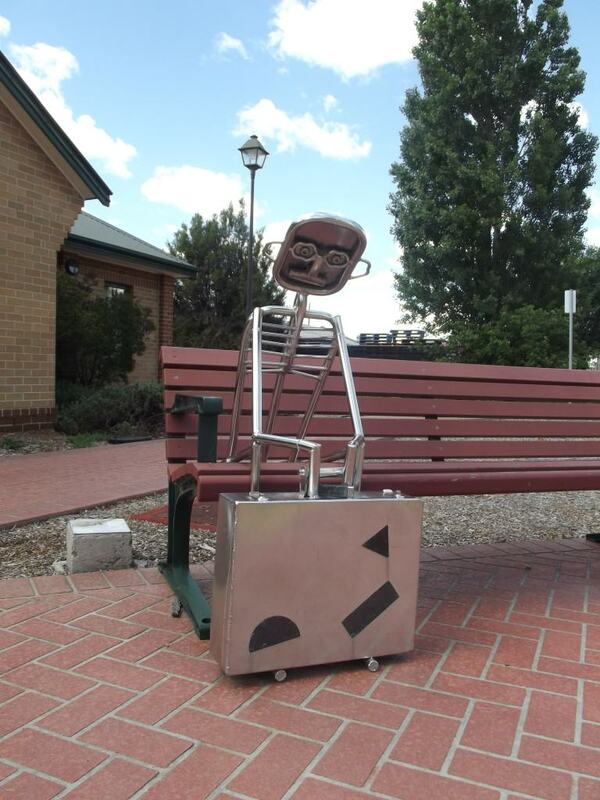 How could we come to Goulburn and not visit this icon. And how amazing it is. There is a gift shop there and a permanent exhibition depicting the 200-year history of wool in Australia. It is said that Australia was built on the sheep’s back. 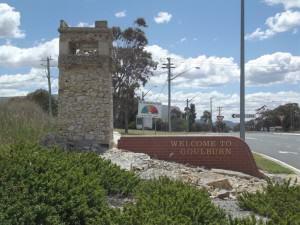 Well come to Goulburn and you will realise just how true that is. Named after Henry Goulburn, Undersecretary for the Colonies in the early 1800’s and it became a major centre for the wool industry and, later, a railhead on the main southern line. Many notable Australian’s were born in Goulburn or make their home there including Olympic gold medallist Michael Diamond, George Lazenby, the only Australian actor to play James Bond, former professional golfer, Bruce Devlin, famous Australian writer, Miles Franklin, and actress Kate Ritchie. There is much more to Goulburn than our one day would allow us to see but that all but guarantees a return visit at some time. And next time we’ll stay a lot longer.